We're heading up to New London, CT, a small port city on the Thames River, which ultimately opens up into the Long Island Sound. But wait, you're thinking, haven't we been to New London before? Ding ding ding! Yes we have, twice! We saw the last remaining NSA Supermarket on S Frontage Rd in the original tour and then in a revisit. 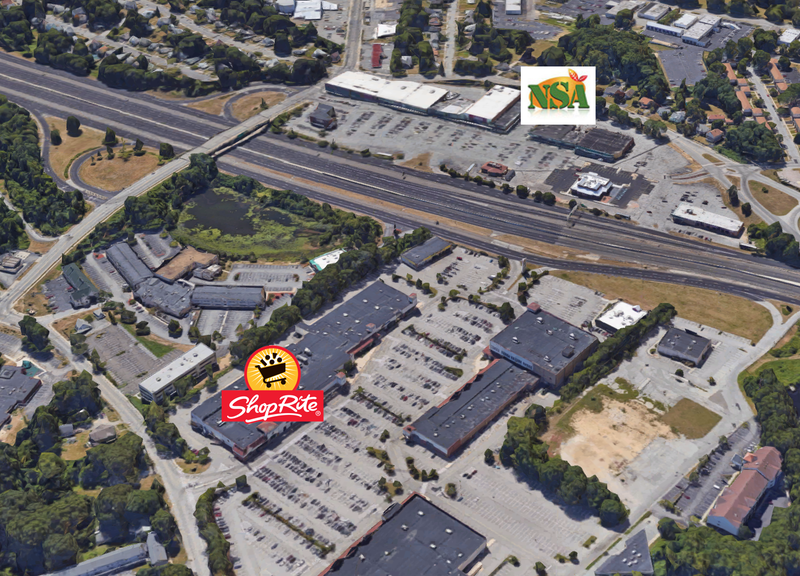 Let's cross the nine lanes of highway separating NSA from ShopRite and check out the larger store. It's OK if you look both ways. Image from Google Maps. I visited the ShopRite when business was very slow on a Saturday night, although it sure looks like this is a very high-volume store. It's certainly a very large store. There are entrances and exits on either side of the storefront, and both bring shoppers into a single entranceway. Produce/deli/bakery line the left side of the store, with meat along the back wall and dairy in the last aisle. 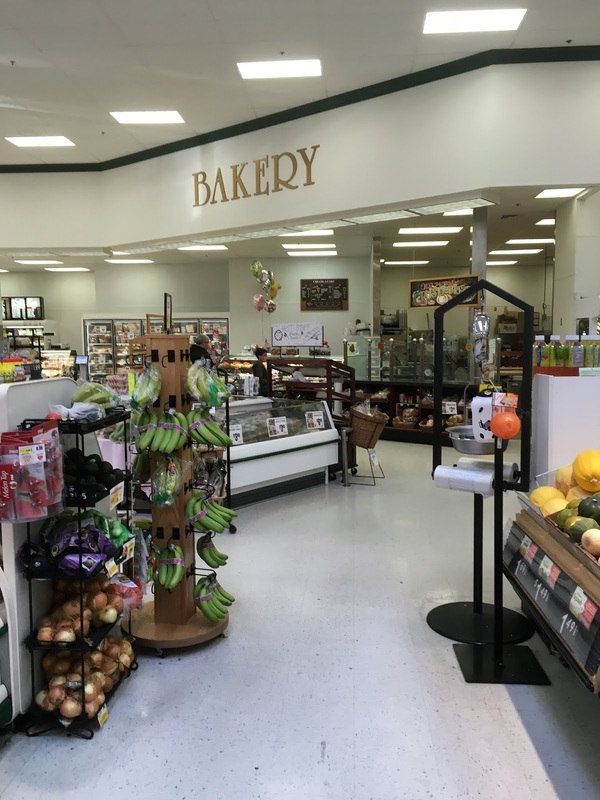 Inside, the store is quite similar to what the ShopRite of Parsippany would have looked like originally, without the various expansions. The outside is beginning to show its age, mostly in style. The logos and lettering are the pre-2002 versions. Not, by any means, a bad looking store. Just a little plain, and a little outdated. It's a little cramped with the carts all lined up here. However, in design, this layout is virtually identical to Parsippany, although the stores' owners are different. You enter to a spacious grand aisle with service departments lining the perimeter. I'm not sure if the "Fresh Street Square" signs were, at one time, a Wakefern promotion or if they were just for this one owner. Either way, they're nice -- although I do wish they actually matched the products they are hanging over! A look up towards the entrance with a bank branch, closed on Saturday night, next to the entrance. 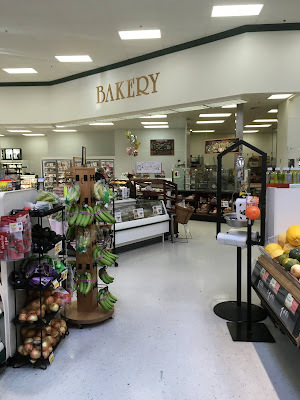 To the right of the entrance is prepared foods and deli, with bakery following on the side wall. While the decor here was probably really trendy when it was installed, it now looks really bland. On the other hand, it is absolutely impeccably maintained, and it's in fantastic condition despite the fact that it's likely 20+ years old. Service bakery along the side wall of the grand aisle. The seafood department is at the back of the grand aisle, with meats continuing along the back wall. Judging by the rest of the store, the pictures and blue fish to the left of the seafood sign were probably added after the decor was initially installed. This frozen seafood sign, just to the right of the previous shot, seems completely out of place. Again, it is also probably much newer than the rest of the decor. Meats continue along the back wall with a row of coffin cases in front. You can see just how large the store is in this shot; it does not end where those freezer cases are. Unfortunately, this store does not pass The Market Report's patented sure-fire ethnic foods test: never buy international foods in a store that labels them "Mexican & Chinese". Most often, the foods offered are the most Americanized versions of the so-called Mexican and Chinese cuisines. As a matter of fact, only a very small percentage of the Latino residents of the NYC metropolitan region are actually Mexican, despite the tendency to call them that. Wide aisles! No clutter! It's beautiful! Beer, which had already been closed up for the night, is located along the back wall next to meats. I'm not sure about Connecticut's liquor laws. Something prohibits them from selling alcohol past a certain time of night, presumably. Dairy in the back corner of the store, although the attempt at the cow pattern is pretty feeble as compared to Parsippany. Cow juice? That's not an appealing image. The frozen foods aisle looking slightly like something from a sci-fi movie. Dairy takes up the rest of the last aisle with equally exciting signage. These category markers have appeared in other ShopRites as well. I think it's an interesting decision to chop off the ShopRite text from the logo, but not turn the logo into a circle as Inserra Supermarkets does. Pharmacy along the front end. Customer service is located at the opposite end of the front-end. 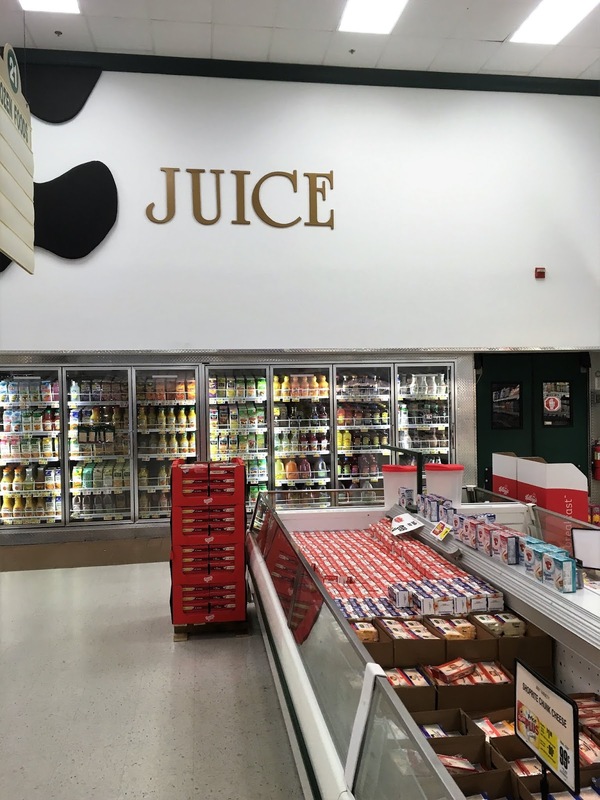 This is your neighborhood, this is your ShopRite slogan likely was installed after the rest of the decor. Spacious front-end with similarly boring graphics (although nice sentiment), and generic lane markers. The lettering here also goes along with the old (pre-2002) logo. 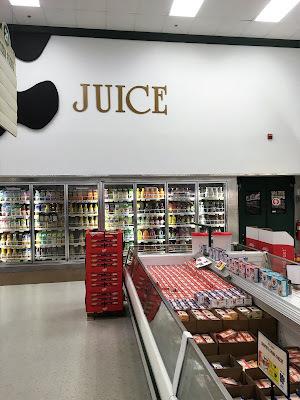 This store is really clean, well-stocked, and spacious, but the decor is deadly boring. Go to NSA for international items and produce sales, and ShopRite for the rest!